Today was an emotional parting as Amy and I left Houston for Arkansas. It was sooooo hard to leave Kristi, as well as, Dad and Mom and Billy. 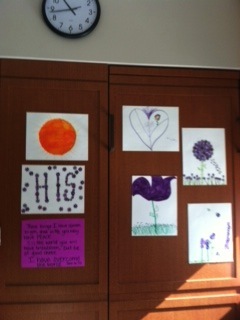 We prayed and thanked God for His Faithfulness and His "Daily" sufficient grace. It has been good for us all to be there and help carry the weight. Wow is it tiring to sit in the hospital for 10-12 hours a day. We have a new understanding and compassion. Kristi has had a hard day. Overall, Kristi is still doing so well considering all she has been through and the trauma to her body. The blood flow to the reconstruction is looking good and overall her body is healing little by little. Much of the swelling throughout her body is going down each day. She is strong physically and is a fighter. Spiritually and mentally she stays clear minded and positive. However, the complications tied to her pain management are not keeping her as comfortable as all of her caretakers would like. She has 4 types of pain medication. Her epidural has been disconnected due to it being ineffective. Her greatest pain is tied to the contractions in the abdominal wall. A muscle relaxant was added and gives her great relief, but it causes her to go to sleep and her breathing becomes too shallow and at times her blood pressure gets too low. This is very frustrating to her and to the nurses and pain team. When the pain is manageable, the side effects become too serious for her. 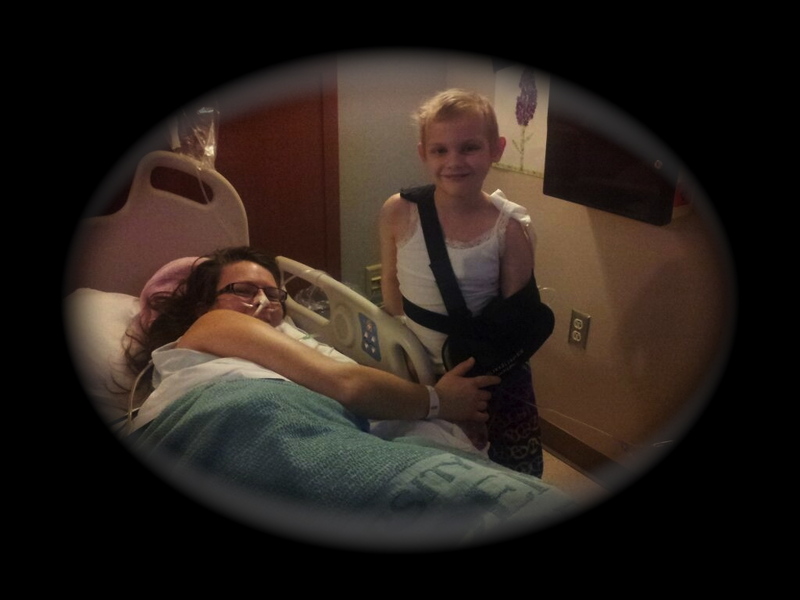 Continue to pray for wisdom for the acute pain team, and for Kristi as she endures the physical pain. It has been hard on all of us to watch her suffer and know we are helpless to comfort her. She is still only able to have fluids through the IV and nothing to drink or eat until her bowels are alive and working again. We were starting to see signs of this occurring today. Praise: Her infection has cleared up with the antibiotics. Continue to pray protection over infections. Her hemoglobin was low again so she was given 2 pints of blood today. This usually helps her feel much better. She was able to sit up in a chair for about 20 minutes today which will help her lungs and get her body working. They wanted her to walk from her old room to a new room, but she was not feeling well enough to do this today. They moved her next door where there is a murphy bed in the wall for whoever stays the night. Billy stayed last night and let Mom get a good night's sleep. There was little sleep due to her shallow breathing setting the machines off all night. Tomorrow will be a busy day with several Dr.'s seeing her and some training will begin for ostomy care. Pray Kristi can get up and move around tomorrow, and for continued healing. Her room number and mailing address has been added to the top right of this blog. Once again, we feel the strength and peace from your prayers and have been impacted by your care. What a hard journey full of lots of blessings!! 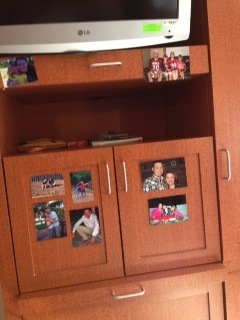 We have placed pictures in front of her to keep her motivated! to decorate her room with! 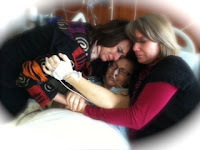 Danielle also has set up the facebook page Team Kristi Prayer Warriors . 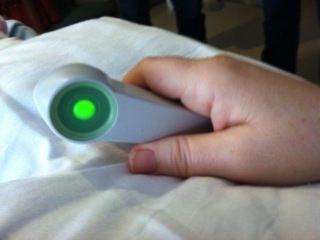 This glowing green pain med button makes Kristi so happy! Thank you Kim. I will make sure Billy knows. She will be primarily homebound for months once she is home so I know your offer will be received.